I'm trying to make a WiFi controlled Car from my old toy car which will be running on ESP8266. 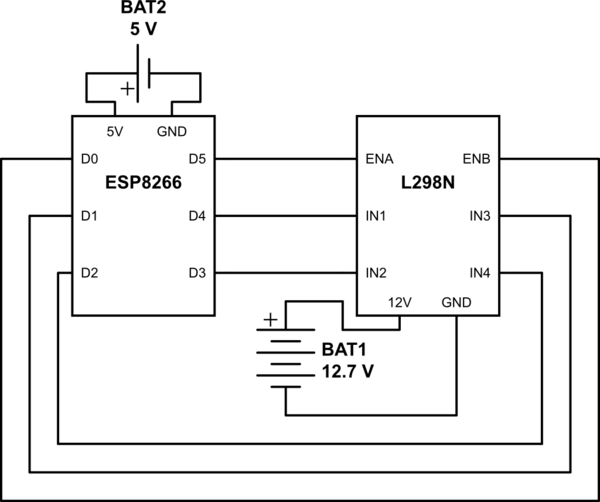 I'm using the L298N motor driver and have one motor for left-right control & other for forward-backward direction control. Now the problem is I'm unable to use more than 3 pins at once. If I even try, likely my code stops working. I'm not so old with ESP or Arduino. So, please help by giving some clarification on this. I found out the problem & it has nothing to deal with ESP8266. It was something like voltage conflict (I don't know the deeper science, I agree). Actually, I was testing by plugging in the USB to ESP & at the same time I had a 11V lipo connected to L298N. I tested by using one single voltage source & everything worked fine. Not the answer you're looking for? Browse other questions tagged esp8266 l298n or ask your own question. Is it possible to use ESP8266 modules interchangeably? 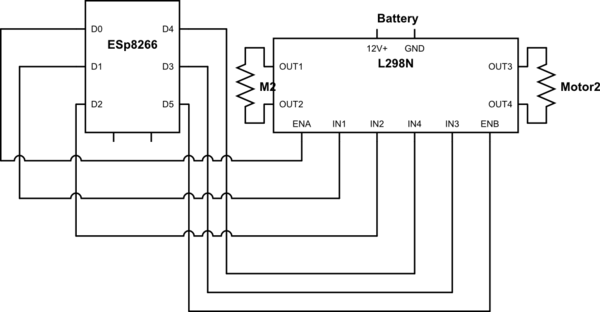 Can I run ESP8266 via Arduino using the PWM pins?